What constitutes “short-term” may differ from person to person, but in Forex, “short-term” refers to trades lasting less than a day. They usually occur within a single trading session (such as London/Europe or New York), with single sessions lasting roughly 6-8 hours. To pare down “short-term” even further, we are looking at trades in which the holding period runs from 240 minutes (4 hours) to one hour to 15 minutes or even 5 minutes. The biggest virtue of short-term trading is that you are not taking risk when you are out of the market. If you trade once or twice a day and your holding period is only a few hours, your capital stake is safe nearly all the time. Moreover, devoting only a small portion of the day gives you back the rest of the day away from the market. Short-term traders can walk away from the market and not be chained to their screens. The drawback of a short-term timeframe is that the trader may become fearful of losing opportunity and act impulsively or on insufficient evidence. Most short-term trades are based on “set-ups” of particular bar configurations/patterns and indicators rather than trend-following. In fact, some traders prefer not to know or consult the primary trend lest it contaminate their thinking, while other prefer to take trades only in the direction of the primary trend because that seems a less risky path. This is not necessarily the case, since even the best behaved primary trends undergo pullbacks. But on the dictum that a stopped clock is right twice a day, trading only with the direction of the primary trend might, over a long period of time, confer a greater probability of being correct. The opening gaps up from the close the period before. The opening bar follows an inside day or doji, indicating a sharp change in sentiment. The opening range has been narrowing over the past 3-10 days. The opening range concept was designed for equities where we have a distinct open and close. Unlike Forex, where the open in, say, New York can be considered anywhere from 8:00 to 9:00 EST and the close anywhere from 16:00 to 18:00. Data services consider 17:59 the “close” but in practice, everyone already has already gone home by then. 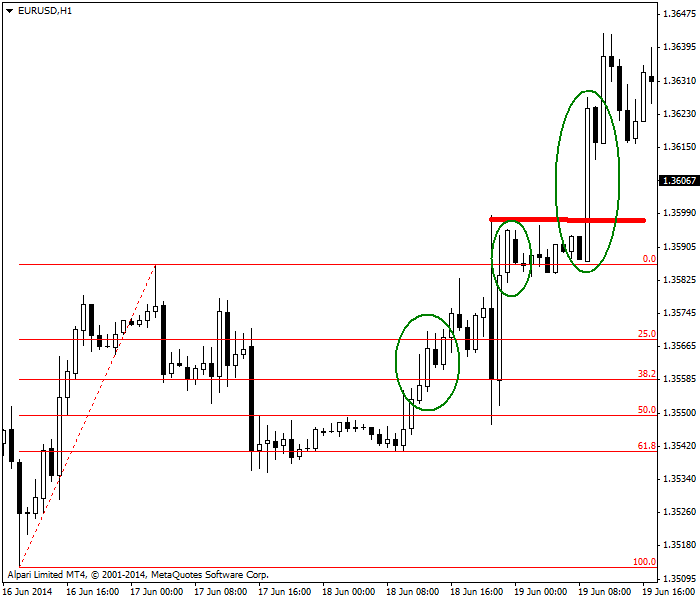 That does not mean the opening range breakout technique does not work in Forex, just that we get very few gaps. The only true close is the New York close on Friday and thus the only true “opening” is the Sunday afternoon opening, although we sometimes get a gap-like price change when Asia hand the baton to Europe. The issue is not that gaps are rare in Forex but rather that when we do get a gap, it always means something — just not always the Crabel opening gap model. The other big names in short-term set-up trading are Linda Raschke and Larry Connors, authors of Street Smarts (1996). This book is still in print as of 2016. The authors name several different strategies, some with cute names like “pinball” and “coiled spring,” but the value lies in the concept of identifying patterns. This is not necessarily as hard as it seems. For example, Raschke has a “swing trading” rule that buys new lows and sell new highs that works quite well in the 4-hour timeframe in Forex. This is one of the virtues of drawing horizontal lines at old highs and lows and expecting a reversal as the price approaches them again. A third resource for short-term trading is Trade What You See: How to Profit from Pattern Recognition (2007) by Larry Pesavento and Leslie Jouflas. This book emphasizes the ABCD harmonic pattern first described by Gartley in 1936. Whatever you think of Fibonacci numbers and whether there is any hidden order of the universe manifesting itself in Forex prices, it is undeniable that retracements in Forex often obey the 50% and 62% “rule” on short-term charts — more often than on daily charts. This is probably a function of so many traders believing they will occur and causing a self-fulfilling prophecy. 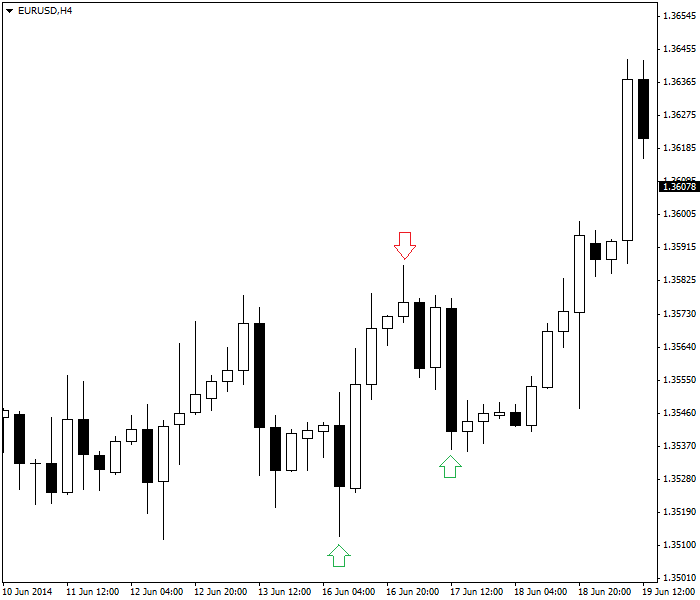 On the chart example below, you can see EUR/USD on an hourly basis. First, we see a low-to-high move and then a downward retracement of a little more than 61.8%. You observe the price fails to fall any further. If you cannot sell it, you have to buy it. You get a first buying opportunity when it goes back to the 50% retracement level (first ellipse). You have another buying opportunity when the price surpasses the previous highest high (second ellipse), and a third buying opportunity when the price surpasses the most recent highest high (red horizontal line). This particular price series has the unhappy surprise of a giant pullback between the first and second ellipses, which reminds you that no pattern is perfect and the market can always throw a monkey wrench into your pattern recognition. It should also remind you that the pattern may tell you when to buy, but it hardly ever tells you when to sell. On an hourly trading timeframe, you may find it hard to maintain a trailing stop and a more practical way of managing the trade is with a fixed stop and a fixed target. Buying new low, selling new high, and then again buying new low. There is no single correct way to conduct short-term trading. Various methods may be equally valid — as long as you can identify a pattern and have a clear idea of how it will progress and where you should enter and exit for a gain consistent with your trading plan. Remember that on a 1-minute or 5-minute chart, the reliability of patterns falls drastically. 1. Short-term trading means any timeframe from 5 minutes to 5 days. gaps are rare in Forex. gaps mean something big has occurred. gaps are definite trading signals.